The Society for the New Message has been able to accomplish so much this year thanks to your ongoing contribution and support. Our work continues in 2018 with great opportunities for Marshall Vian Summers and The Society to reach millions of people with the gift of the New Message from God. October 20th, 2017 marked the historic launch of the new Worldwide Community Site. This engagement platform serves to build relationships of shared purpose and meaning around the mission of the New Message and its Messenger; to strengthen our studenthood and to journey the long and rewarding path in The Way of Knowledge with others. 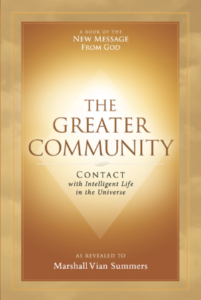 The Society published The Greater Community: Contact with Intelligent Life in the Universe which is now available in print, eBook and free online. The Greater Community presents a revolutionary set of teachings to prepare people everywhere for the reality of contact that is occurring in the world today. The ongoing Greater Community campaign continues to bring forward new awareness, education, and preparation for humanity’s emergence into a Greater Community of intelligent life. Give away over 300 books of The Greater Community at conferences and gatherings in the Netherlands, United Kingdom, Arizona, and Wyoming. Spread the teaching and message of The Greater Community and The Allies of Humanity Briefings on Facebook, Twitter and YouTube. Film a new series of teachings by Marshall Vian Summers on the reality of humanity’s contact with intelligent life. Expanded outreach efforts took place in the past 12 months through your contribution, support, and advocacy both in person and on social media through Facebook, YouTube, Twitter, and other emerging platforms. Four articles were published in major world news outlets such as The Atlantic, Ozy, and Express UK which mentioned The New Message or covered it specifically. The newmessage.org website reached nearly 340,000 new visitors and over one million page views. The 24 international New Message websites doubled their reach with 85,000 new visitors and nearly 190,000 views. The New Message Facebook efforts reached nearly 2 million people and had over 250,000 engagements. The New Message Twitter account had over 400,000 views and impressions. The videos on our YouTube channel had over 150,000 views in the last year with many more views on other channels. 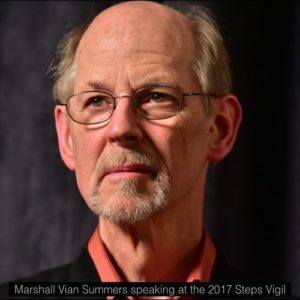 The Messenger Marshall Vian Summers released 14 special teachings, prayers, and global messages for humanity. 7 live radio, podcast and YouTube video interviews with Marshall and his son Reed Summers took place presenting the reality of the New Message and the Greater Community to new people around the world. In addition, Marshall, Patricia and Reed were interviewed extensively for the upcoming feature-length documentary Angels or Aliens, which will explore how spiritual and religious traditions respond to the phenomenon of ET contact. In total over four hours of interviews were recorded for this documentary, and much will be released free online alongside the film. 958 books were given away for free this year through the Free Book Project. Also available at no cost are 211 revelations, many with the original downloadable audio of the Voice of Revelation, along with 58 free revelations on the New Knowledge Library store. The Free School of the New Message continues to grow with hundreds of new signups this year and over 52 campfire chats held or scheduled. The English New Message email list has grown with over 1,800 new sign-ups this year, reaching over 8,700 people globally with news and updates from The Society. To summarize the past year, The Society has been able to make major leaps in bringing the New Message to people worldwide because of your financial support. Yet the work of the mission only grows as we move forward into the New Year. Bringing forward the gift of the New Message and making it available to as many people as possible is truly a vast undertaking with many steps and accomplishments and will require the continued financial giving and dedicated participation of students and readers around the world. The continued rendering and publication of the core books of the New Message from God with the upcoming book Preparing for The Greater Community, followed by The New Life, The Power of Knowledge and other books of Volume 1 of the New Message. The Greater Community Campaign will continue into 2018. Stay tuned for updates on the Campaign News Group on the Worldwide Community Site for how you can get involved. Continued growth of the Worldwide Community Site. The site will host the Free School, forums, groups, and chat rooms. It will also include news, teachings, and inspiration from the Messenger and The Society. Further expansion of our collective outreach efforts by creating more platforms across the internet and social media to make the New Message accessible and findable to people all over the world. Hosting The Messenger’s Vigil, The Steps Vigil, and the bi-annual Encampment of the New Message from God in 2018. Printing and distributing The Allies of Humanity: Book 1 in a number of new languages. Launching a number of new international websites. And much more! New endeavors and opportunities to participate will be shared on the Worldwide Community Site and in upcoming emails from The Society. Pillars of the New Message are the financial foundation of The New Message and its mission in the world. These are students who give $100 or more each month to support the mission of the New Message, providing the foundation of inspired contribution beneath this vast and historic Revelation, the largest body of Revelation ever to be given to the world. As of today, there are 97 people who have stepped forward to be a pillar of the New Message. They have stepped forward to help the Messenger carry the burden of his Revelation and to help him give this gift from God to the world. But now more people are needed as the Revelation grows and moves in new languages, in new countries and on new platforms online. During the Fireside broadcast on November 18th, 2017, Will Burrows and Reed Summers asked if we could reach the level of 100 pillars for the New Message. Will you step forward to help the New Message reach 100 Pillars by the end of 2017? If you are not already a pillar and if you feel called, we invite to take the next step and join the community of givers supporting the New Message. Friends of the New Message contribute on a monthly basis at any level to support the core work of The Society. For years, the Friends have provided a solid foundation for The Society’s growing endeavors. As of today, there are 50 people giving as Friends of the New Message. A one-time donation can significantly further the education and outreach mission of The Society in 2018 and free us to begin vital endeavors that have been held back. We welcome your one-time donations to support this growing work in the year ahead. If life has given you the financial means to become a Benefactor, you may have a historic role in assuring the success and preservation of the New Message from God into the future. Please contact us to discuss a plan for giving at this level–which could include a donation of land, stock, will, bequests or other forms of planned giving. Contributing at this level allows God’s New Message to move into the next level of its expression in the world. A huge thank you to the 240 people who have already given financially to the New Message in 2017! Your financial commitment is an expression of Knowledge and relationship to the New Message and to the Worldwide Community of students who are gathering now to receive it. Together we are working reach humanity with God’s New Revelation and awaken the sleeping power of Knowledge in the human family at a time of global change and upheaval. We invite you to join The Society in this sacred cause, a cause that is essential to the future of our world. Together, we can give the world the greatest gift imaginable. With great blessings and appreciation to you, we look forward to our continued work together in 2018.